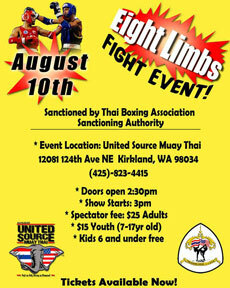 Brycen Srithongkhan (United Source Muay Thai) defeated Loyal Sem (South Sound Martial Arts) via TKO due to referee stoppage at 1:02 of Round 2. Loyal Sem receives a 30 day suspension. No medical clearance needed. BOUT 2 Jr. Boys 65.1-75 lbs. Alex Hernandez (South Side Martial Arts) defeated Jayden Moses (United Source Muay Thai) via TKO due to referee stoppage at 2:00 of round 1. Jayden Moses receives a 30 day suspension. No medical clearance needed. BOUT 3 Jr. Boys 95.1-105 lbs. Jiovani Cervantes (South Sound Martial Arts) defeated Ajala Wilson-Daraja (United Source Muay Thai) via TKO due to referee stoppage at 1:50 of round 1. Ajala Wilson-Daraja receives a 30 day suspension. No medical clearance needed. BOUT 4 Sr. Mens 195.1-215 lbs. Lawrence Vickers (South Sound Martial Arts) defeated Gary Hagen (West Coast Fight Team) via TKO at the end of round 1. Gary Hagen was unable to continue due to self sustained injury, not related to the action of the fight. Therefore there is no suspension given. BOUT 5 Mens 186.1-195 lbs. Ryan McKelvy (Burke Camp) defeated Christopher Bishop (Seth R Lee Gym) via TKO due to referee stoppage as a result of the "3 knock down rule" at 1:05 of round 2. Christophe Bishop receives a 45 day suspension. No medical clearance is needed. BOUT 6 Mens 165.1-172 lbs. Benny Hemly (South Sound Martial Arts) defeated David Kearns (Newborn Jiu-Jitsu Gym) via Unanimous Decision 30-27, 30-27, 29-28. BOUT 7 Mens 172.1-179 lbs. Mark Wittig (South Sound Martial Arts) defeated Justin Carley (Anytime Fitness Muay Thai) via Unanimous Decision 30-25, 30-25, 30-25. BOUT 8 Ladies 147.1-153 lbs. Annie Sit-Chaisai (Chaisai Muay Thai) defeated Mikyla Sakurai (United Source Muay Thai) via Split Decision 29-28, 29-28, 27-30. BOUT 9 Mens 147.1-153 lbs. Ryan Quenneville (Team Eastside) defeated Evan Avilla (Thongsai Muay Thai) via Unanimous Decision 28-29, 28-29, 28-29. BOUT 10 Mens 165.1-172 lbs. Bobby King (United Source Muay Thai) defeated Grant Schwallie (Newborn Jiu-Jitsu Gym) via KO at 1:35 of round 3. Grant Schwallie receives a 45 day suspension.